I swear, the better part of the last 6 weeks has been dominated by getting ready to be away from home, being away from home, recovering from being away from home, and being sick. We spent most of last week up visiting my mom while my dad was away fishing and my hubby had meetings for work. It was a good visit — I spent quality time with their lawn tractor as per my usual and then we did some apple picking and a few other fun things around the area with the kiddos. In our down time, I managed to finish up my Hamlin Peak sweater which I have all washed and dried and just need to get some photos taken along with another long overdue FO that has been patiently waiting photography. Suffice to say though, I was happy to get home Friday afternoon and have the weekend to settle in. I had plans to relax, cook off some of the produce from my parents’ garden we’d brought home, and maybe mow the lawn. 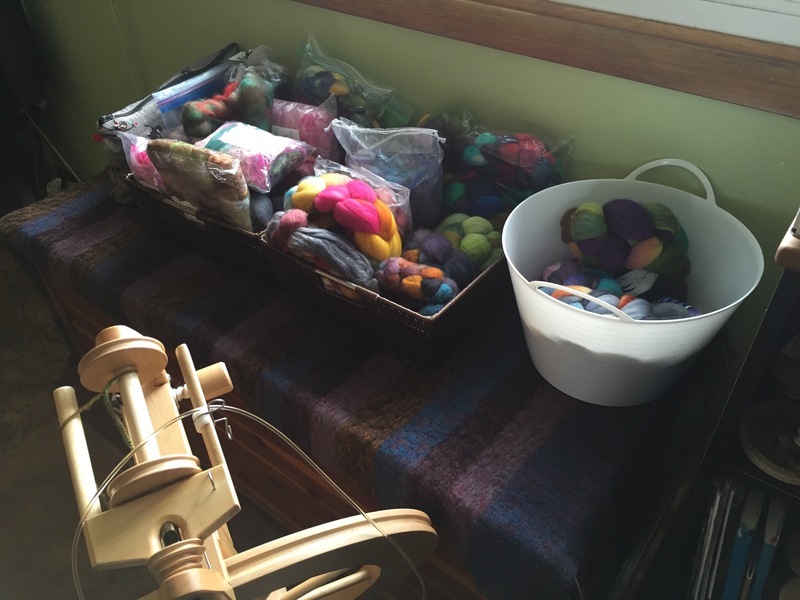 It was the heaps of disorganized fiber-related stuff that posed the more time consuming issue. 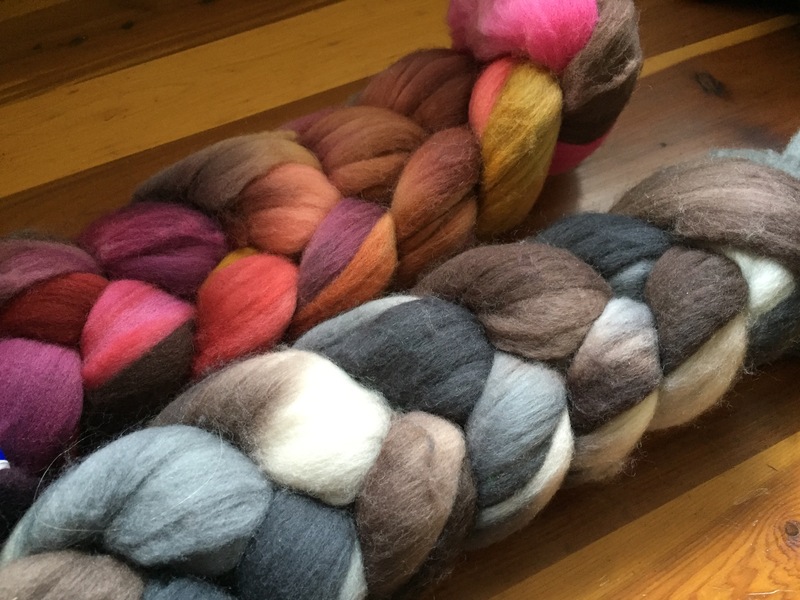 From top to bottom: Blooming Treasures (Polwarth/TussahSilk), Night Light (SWmerino/nylon), and Damselfly (BFL). String of Hearts (SW Targhee) and Rattlesnake (Merino). I figure if I prep them all, I should be more than ready for the week. The muffins were the perfect mid-morning snack, but alas proved too much for my poor hand mixer. As I added the flour, there was a pop, some flames, and then a lot of smoke. After 15 years and a lot of mixing, we were forced to say farewell. It was kind enough to get through the hardest part of this job though, a fact for which I’m very grateful! 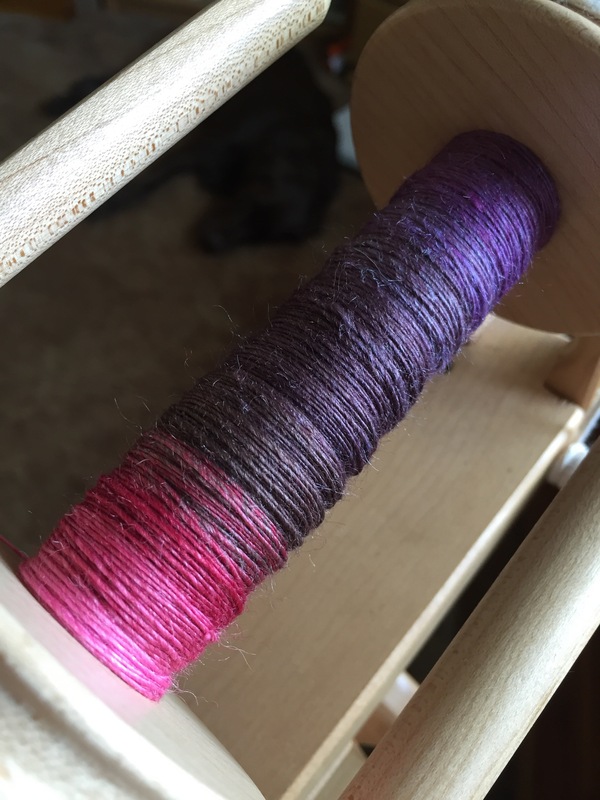 This is Romi Hill’s Swoop in Dyeabolical‘s Tenacious Sock in the Fuchsia So Bright & Lucy colorways. 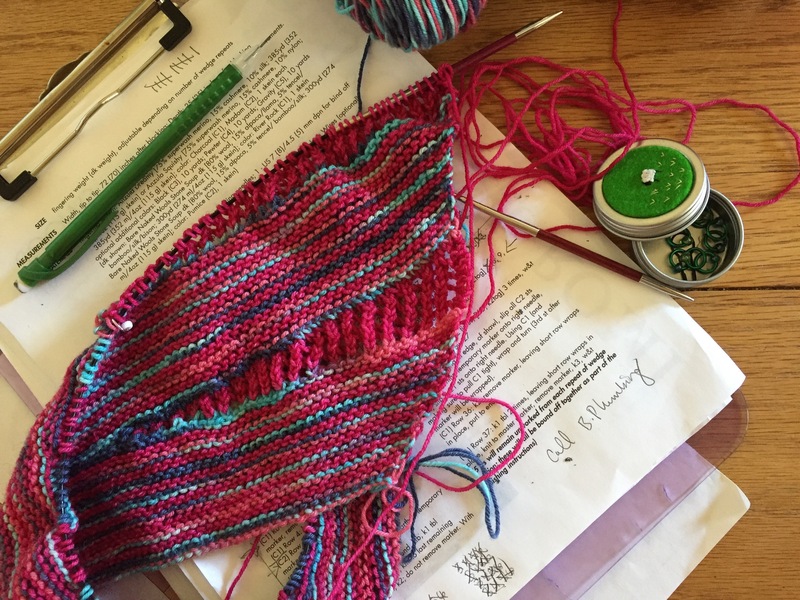 I love the knit — it is SO fun and yet, we had a little disagreement that ended up requiring me to rip back a full repeat (hence all the messy-looking yarn in this photo). Alas, we are friends again and I’m happily knitting along. So… that was my “relaxing” weekend. It seems there’s really no containing the rush of being home again, at least not for me. I hope your weekend was whatever you wished it would be (and did not involve any appliances on fire)! 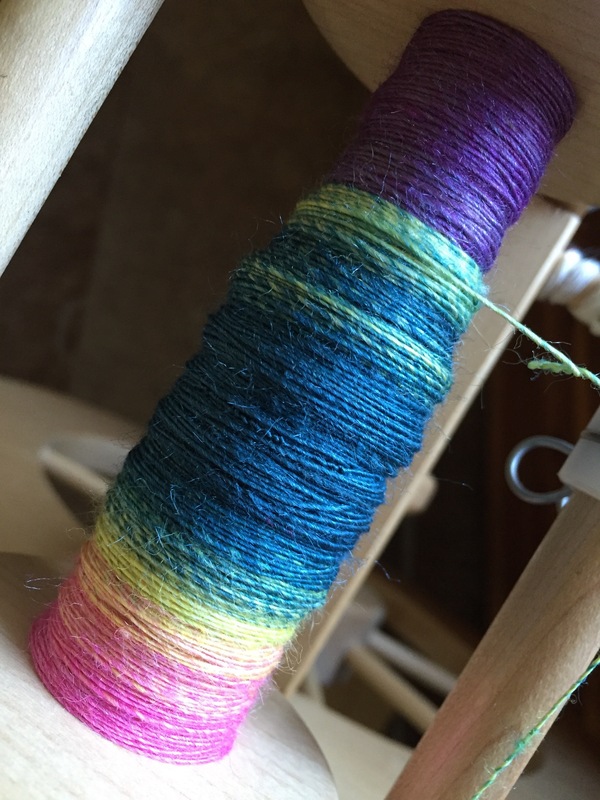 I love your spinzilla choices and back up choices, TWF does have amazing colors! The knitting looks good as well – that is going to be very pretty. Can’t wait to see the FOs – hope you get a photographer soon. And Moose – well, he is just too cute for words. TWG does have amazing colors – indeed! 🙂 I’m so lucky I get to work with them as much as I do. The lack of photography has been as much lack of photographer as I really want photos of the items ON and I’ve just not been feeling great the last month. I think I can finally pose as a healthy person, so hopefully soon! Glad you are feeling better!!! And you are lucky, I am quite jealous! That’s awesome! We don’t have anything layered in formally, but we take a crafternoon every now and then. 🙂 Best of luck to your sister — the first year is always a little bit of a whirlwind! I’ll let her know that, I think she is pretty overwhelmed most of the time. I was overwhelmed and exhausted the first year and have been slowly unwinding since. This year it almost seems too easy — the kids are much more independent, know the expectations, and are just so good. It just takes a little time for everyone to adjust. That is super! This was not my sister’s desire at all, but private school turned out to not be an option, and the local school was a very bad for my niece – last year was really frightening, So, my sister and brother-in-law are giving it a shot, and hoping for the best. I have a cousin who owns a home school support business, and she is really helping them a lot – teaching the math, for instance! – so we all hope it works, and my niece has a much better school experience now. I will tell my sister that in your experience, it gets better! For my hubby, homeschooling was never much of a leap. For me, it was a huge, no, a HUGE leap. I would have really loved to keep my kids in public school in a lot of ways, but it really just wasn’t an option. why thank you – I will let her know that. I think my cousin is a huge help to her – who knew there could be a small biz in home school support? – but it is also good from regular people who are doing this. We all hope it works out well for everyone involved. 🙂 My niece introduced my sister as “my bossy mother” recently, I am hoping they learn to work well without anyone having to be bossy! I saw my sister and niece on Friday (at Maine’s fabulous Common Ground Fair, I looked for you….) and my sister looks so relaxed! She is LOVING homeschooling, not fighting to get E up and out the door in the morning, not fighting with the school to have special needs addressed. I asked E about it, and she said she hates home schooling. Misses her friends, even though she participates in soccer and other activities. But as my sister says “I don’t hear her complaining when she can sleep until she wakes up, read in her PJs all morning, go to the fair on a Friday…” so I think they will both adjust just fine. That’s awesome news! I think the friends thing is something that can be tough. My daughter is a very social animal, so she says that, too, even though she never really bonded with anyone in her class because there was so much stress there (there were major behavior issues in the room among other things). We meet up with homeschool kids though now and then and do a homeschool art class, too. I think it’s something we’re sensitive to and always work on, but also something that will evaporate as soon as they get their first jobs and all that. So glad to hear it’s sounding like a win! 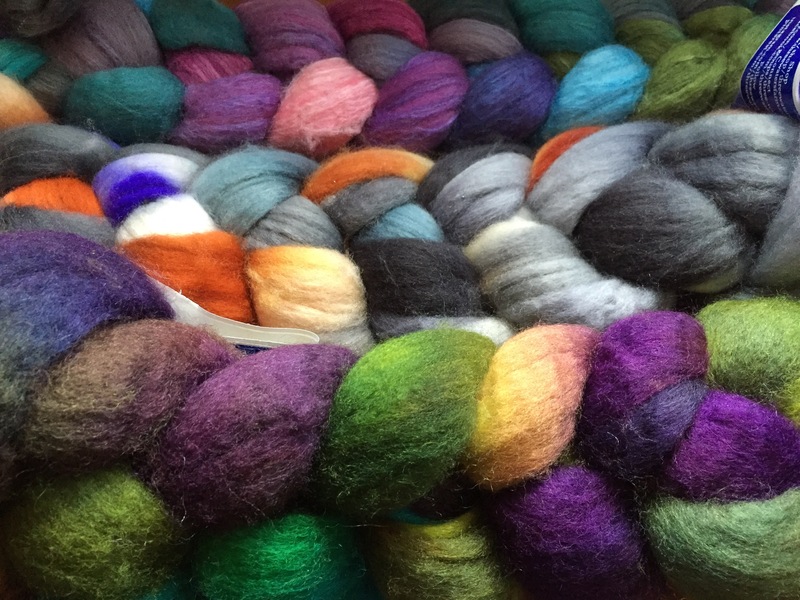 I love the clouds of wool you use…they are gorgeous! Thanks! 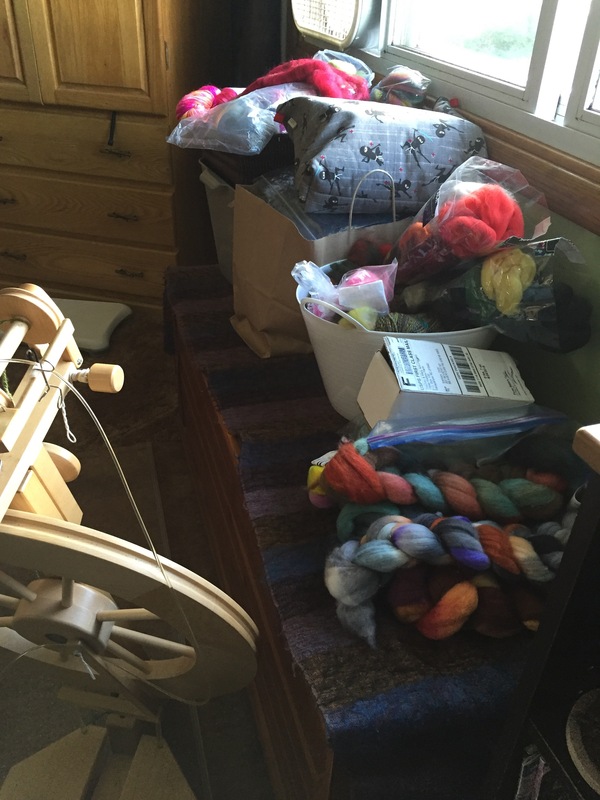 I spin fiber from some mighty talented dyers! I think I should probably have a heavier duty mixer for as much as I use it (at least a couple times a week). Oh well! 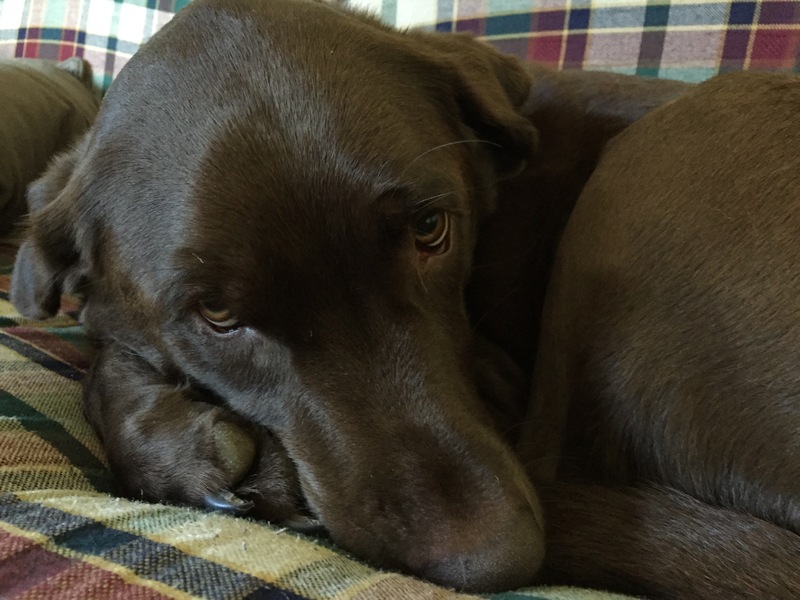 My Moose is a chocolate lab. 🙂 Chocolate Moose! That’s my problem, too — I really just don’t have the space for the size I probably should have for what I do. 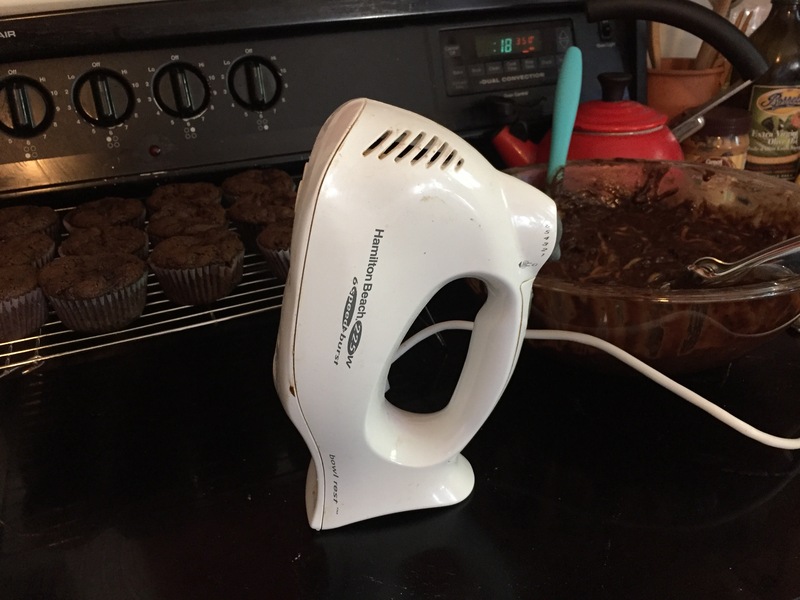 So a hand mixer it is! My son named Moose — I certainly had other ideas, but when you get a puppy and your 1st grader is really proud of the name he picked, you go with it. 🙂 He turned out to be an 80lb monstrosity of a dog, so it pretty much suits him. I actually think it’s really pretty simple. The only thing I’d recommend is that if you have to rip back mark where you have the master marker before you pull the needles out. It’s a bit challenging to recover without that spot marked. Otherwise, it’s simple and easy. I’m lovin’ it! Great tip on that marker. Appreciate it! My pleasure! I’m on repeat 7 of 9, so I’m flying through this project at a nice clip — I may even finish by the end of the month! Just have to clip ends and give it a bath now! A great achievement getting your spinning corner in order, all those fabulous colours look amazing. Thank you! The space is really small, so it’s always evolving in one way or another. I’m happy with the results though & you are right — the colors are awesome, very inspiring, too! 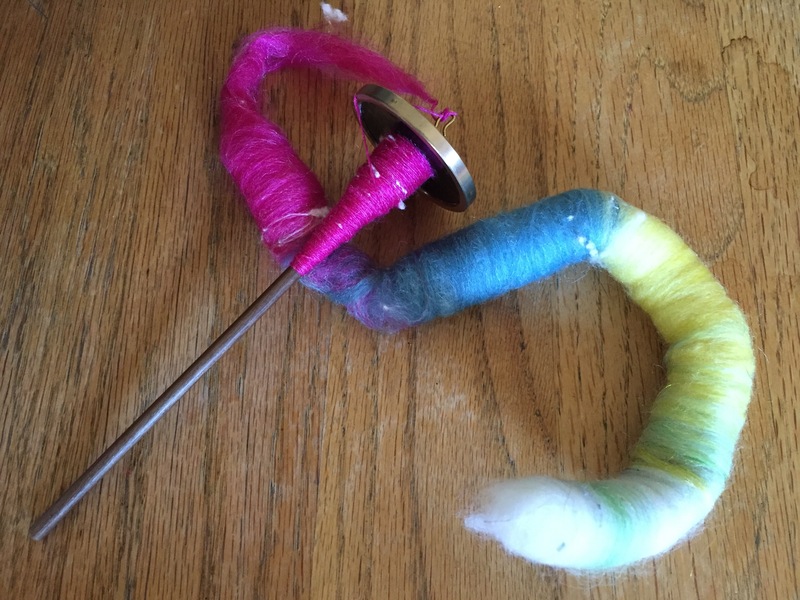 I was wondering if you were going to do Spinzilla! This will be my first year to jump in and do it, so it will be fun to spin along with you. Yes! It’s my first year, too! I’ve got to start prepping my fiber this week! What team will you be on or are you rogue?